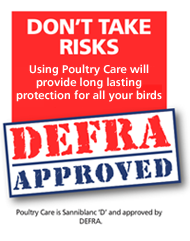 This DEFRA approved disinfectant is suitable for use outdoors. 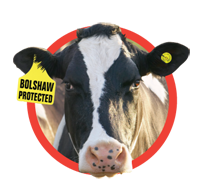 It is most effective in the pasture areas close to the poultry sheds; the most likely source for droppings and potential flock contamination. 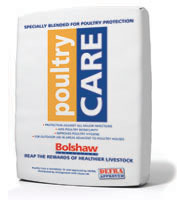 Poultry Care maintains a sterile alkaline environment in excess of ph 12 for sustained periods. The reaction of Poultry Care with water creates a sudden temperature rise to over 70°C that destroys all but the most thermally resistant organisms. During this reaction Poultry Care absorbs the water from the treated area to create a more stable and sanitary environment. Poultry Care also kills off the biological organisms that cause odours and prevents fermentation of the effluent. Coop Care Housing is available in 5kg and 10kg containers for poultry enthusiasts operating on a smaller scale. Coop Care is a specially ground lime product that effectively sanitises the coop. Spreading Coop Care will kill bacteria and provide a healthy housing environment for the flock. 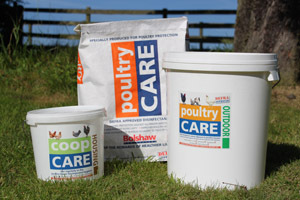 As well as acting as a disinfectant, Coop Care will also deodorise the poultry house. Together this will reduce the number of flies in the coop; a well known source of poultry infection.